Due to his injury in August he didn't played in most of pre-season games, and started the season not as a starter . His best performance, yet was at Kaisariani against Sporting, with 20 pts and 4 rebounds and against Panionios with 23 points, 5 reb . 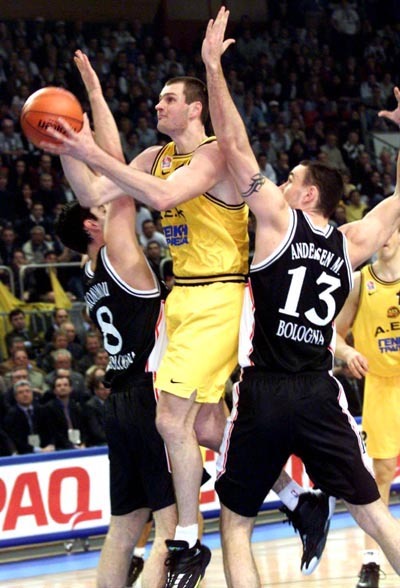 But his better remembered performance was against Kinder in the Saporta Final when he scored 15 points and took 6 rebounds . In A-1 with Aris he played 15 games (including playoffs) averaging 15.5 ppg . He was voted best 6th player in A-1 regular season for 1999/00 . He won the Greek Cup with AEK in 2000 & 2001 . His nickname is "Sepp" and was nicknamed "amblik" as a youth, which means "spider"